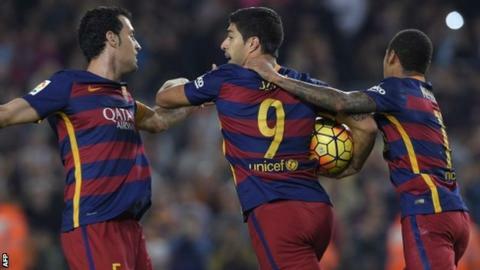 Luis Suarez scored a hat-trick as 10-man Barcelona came from behind to beat Eibar and keep pace with Real Madrid at the top of La Liga. Borja Baston gave the visitors a shock early lead with Eibar's first ever goal against Barca. Suarez headed the hosts level before half-time and fired them ahead early in the second half. Suarez levelled 11 minutes later with his side's first effort on target, the Uruguayan heading home unchallenged from close range after Neymar and Sandro combined. Moments after the visitors missed a chance to go back in front, Suarez drilled home a shot from just inside the area after Neymar's pass. Mascherano's straight red card offered Eibar late hope. Barcelona boss Luis Enrique: "We know the importance of Luis. What he gives you is invaluable, non-negotiable. If he then finishes in the area, that's great. He's essential and irreplaceable. On Javier Mascherano's red card: "It would be terrible to lose him for several games, but they should look at whether these expressions are spoken into air or with eye contact." Match ends, Barcelona 3, Eibar 1. Second Half ends, Barcelona 3, Eibar 1. Eddy (Eibar) is shown the yellow card for a bad foul. Delay in match Eddy (Eibar) because of an injury. Neymar (Barcelona) is shown the yellow card. Ander Capa (Eibar) is shown the yellow card. Ander Capa (Eibar) wins a free kick in the defensive half. Corner, Barcelona. Conceded by Ander Capa. Goal! Barcelona 3, Eibar 1. Luis Suárez (Barcelona) right footed shot from the centre of the box to the bottom left corner. Assisted by Neymar with a through ball. Javier Mascherano (Barcelona) is shown the red card. Aleksandar Pantic (Eibar) is shown the yellow card for a bad foul. Foul by Mauro Dos Santos (Eibar). Substitution, Eibar. Saúl Berjón replaces Takashi Inui. Attempt missed. Ivan Rakitic (Barcelona) right footed shot from outside the box is close, but misses to the right from a direct free kick. Attempt missed. Luis Suárez (Barcelona) left footed shot from outside the box is high and wide to the left. Assisted by Neymar with a headed pass. Attempt missed. Eddy (Eibar) right footed shot from outside the box is high and wide to the right following a set piece situation.